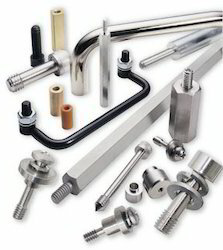 We are offering Panel Fasteners to our clients. Ease of assembly and quick removal (without loose hardware) are major reasons to specify panel fasteners. They satisfy many functional and cosmetic requirements. Our panel fasteners offer large slotted heads for tool or finger operation and are also available with a Phillips head. Being a well-distinguished company in the market, we are into offering Solar Panel Fastener. Stockist, Dealers, Sub-dealers and Manufacturers Panel Board Handles are made up of Stainless Steel, High Tensile & Mild Steel Studs as per customer requirements. This category includes - panel fasteners / spring loaded / clinching hardware/ access hardware/ thumb screw / various plungers and more. Advanced TCA® specifications for telecom rack systems require two clinching fasteners: a self-clinching alignment pin and a captivated screw. The PEM® Type TPXSTM pin meets the ATCA PICMG 3.0 specification for a 3mm alignment pin. The 15° tapered point makes engaging the mating hole easy.